Ruby on Rails is a server-side web application framework that is completely designed in Ruby under the MIT license. Rails can be viewed as an MVC (model view controller) framework that has built-in support and provides structure for a database, web services, and web pages. 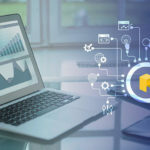 Nearly 1 million live websites use Ruby on Rails now which is why companies like Stackify are starting to support Ruby with their solutions like Retrace to ensure no errors slip through the cracks as deployments get pushed into production. There are plenty of sources such as online courses, tutorials, blogs, YouTube channels, podcasts, e-books, and development tools as well. You can easily find a lot of online communities created by the Ruby developers that generally answer frequently asked questions. For instance, Stack Overflow is a platform that has around 280,000 questions related to Ruby on Rails. Similarly, GitHub is another place where you will find the answer to thousands of questions related to Ruby. 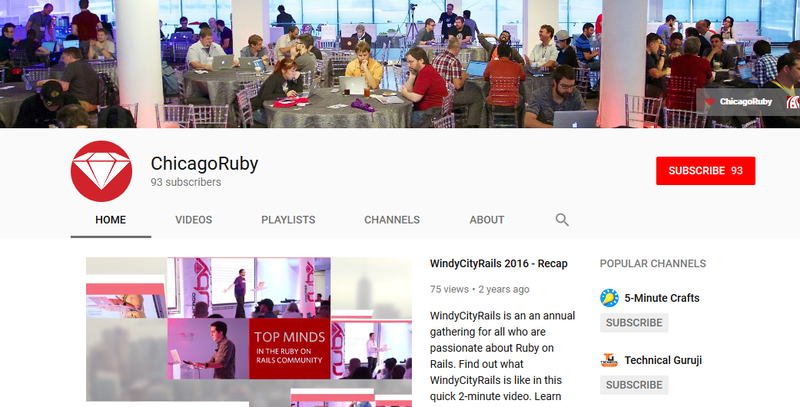 In this article, we will introduce you to some of the best and reliable online sources like blogs and YouTube channels in order to learn Ruby on Rails. These sources are provided to you after thorough research and complete analysis. So without wasting further time, let us start exploring such blogs and YouTube channels. First, let’s find out the best blogs to learn Ruby on Rails. This is the official blog of Ruby on Rails, which is often referred to as Rails. It is among the best blogs to learn Ruby on Rails programming language. 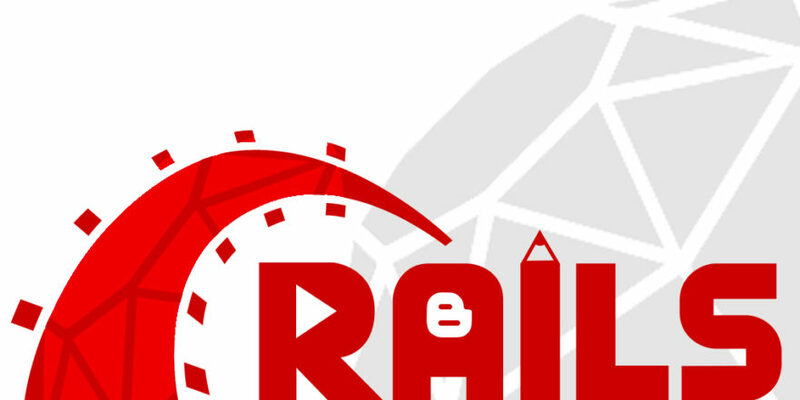 It has a huge collection of Rails articles that cover almost all the concepts of Ruby on Rails. 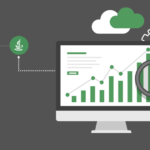 It includes topics like Introducing action text for Rails 6, Multi env credential support, Action cable channel unit testing, Read replica database configurations, faster parameter filtering, cookies with purpose etc. Around 1 post is updated regularly on a weekly basis in this blog. 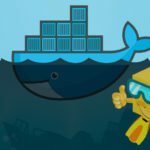 O’Reilly is a leading learning company that assists users, developers, and even big communities to learn and develop skills by implementing technology-driven transformation. They have created their own blog that contains several Ruby tutorials and interview videos of experienced developers from all over the world. Reddit for Rubyists is a subreddit where you can get news about the Ruby programming language. Reddit is one of the most popular communities where millions of people post, vote, and comment daily. You can share the content of your interest in the form of texts, videos, images, links, and stories. You will find comments and questions related to your topic of interest as well. It is the fifth most visited site in the US. It has more than 400,000 Twitter and 1,000,000 Facebook followers. Around 34 posts are updated regularly on a weekly basis. Does the GIL code make your Ruby code thread-safe? 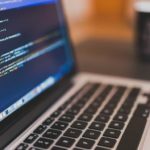 If you are already working with Rails, then you can opt to choose this blog as it will notify you in case of new security updates. This blog was first deployed in November 2016. This provides updated news, good opinions, and well-organized tutorials. 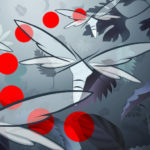 This blog is designed by Jonathan Rochkind. It can be viewed as a good aggregator that has the ability to increase the cohesion of the Ruby community. 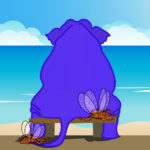 Around 17 posts are regularly updated per week in this blog. It also has some followers on Twitter. The company Railsware is located in Europe and has clients from all over the world. They have a strong expertise in Ruby on Rails, and JS Frameworks, and also produce their own digital products. 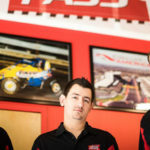 They have more than 1,000 followers on Twitter and around 500 on Facebook. They publish around 3 posts a month on this blog. In this blog you can find information related to other languages like Python and Node.js. 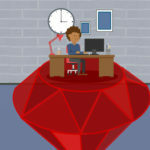 Stackify’s blog is a great source of information, news, and tutorials on Ruby on Rails and other programming topics. 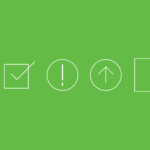 Our blog aims to provide high-quality content that is valuable to the developer community. 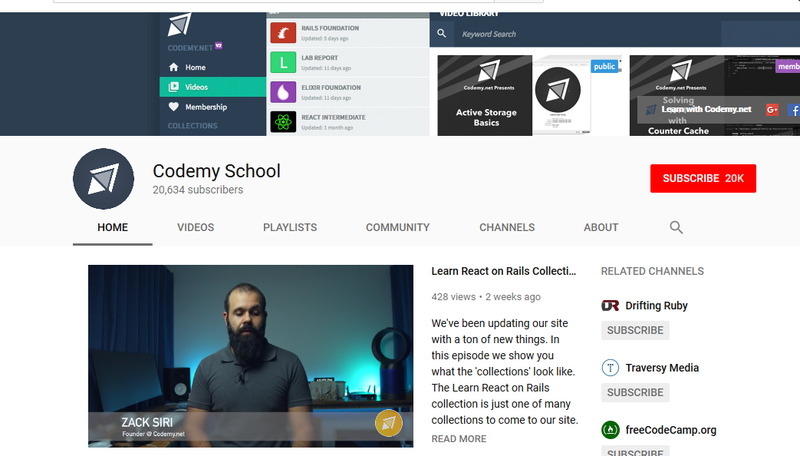 Now let’s have a look at YouTube channels to learn Ruby on Rails, or simply Rails. There are numerous online tutorials available on YouTube where you can learn and understand all the concepts of Ruby on Rails. 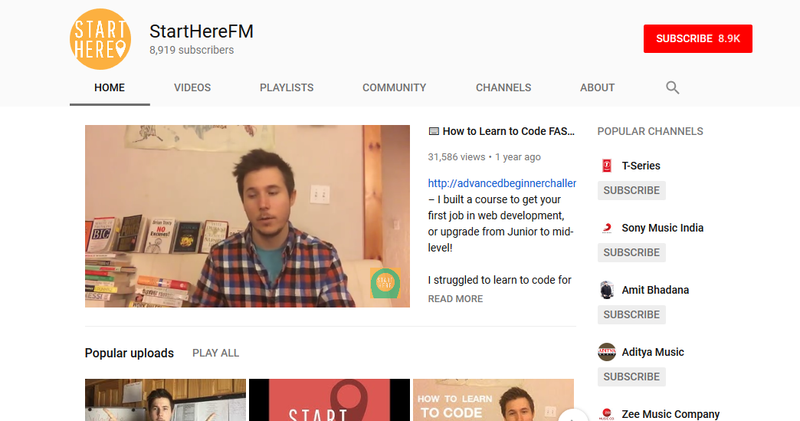 On the basis of total YouTube subscribers, the total number of video views and liked, we have highlighted the best YouTube channels where you can start your journey of becoming a Ruby developer. 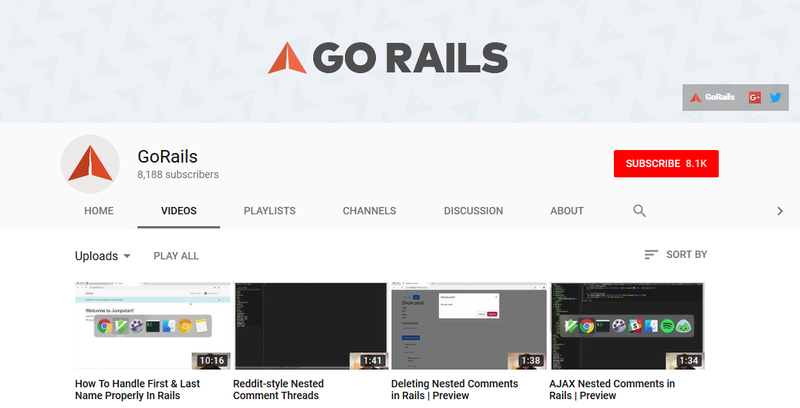 GoRails offers easy-to-learn and good-quality video content through which you can easily understand the confusing pieces of Ruby on Rails. You can easily learn how to design code and become a proficient developer. With the help of videos, you can quickly understand difficult topics. It uploads 1 video per week on the channel. thenewboston provides tutorials related to computer and different programming technologies. It has more than 7,000 overall tutorials and videos. These tutorials are specially designed for beginners as well as professionals very easy to learn and understand. It was first introduced in February 2008. 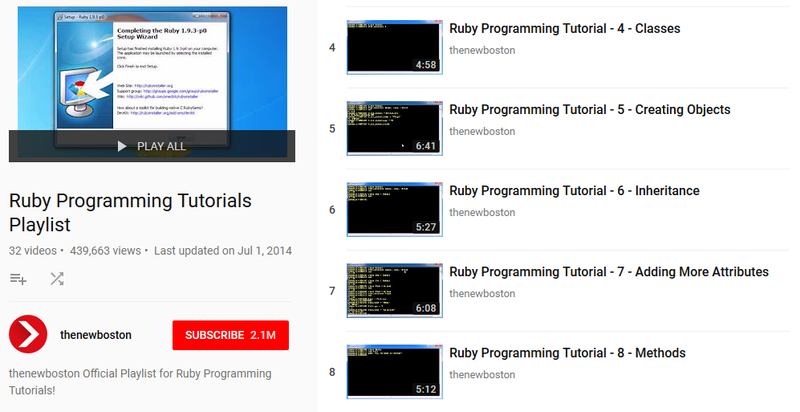 It has a very useful collection of 32 videos of Ruby on Rails tutorials. You can learn from installing Ruby to writing your first program in Ruby. Codemy is the best place to learn something online. It is among the most popular YouTube channels and has only one motto, there is always something to learn. Here you can easily learn about languages like Ruby on Rails, Docker, HTML, CSS, Bootstrap, and CoffeeScript. 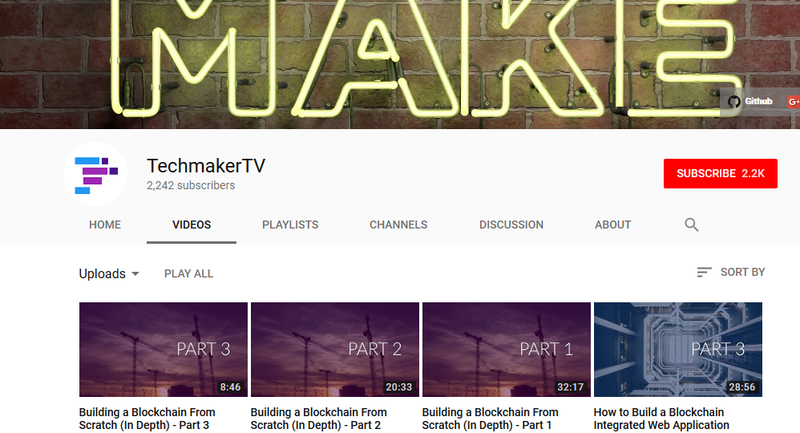 This YouTube channel was first launched in March 2013. Apart from programming languages, it also provides a better quality training platform for web development, Startup Tech, how to start a company. You can also expect some new courses from codemy like Elixir and iOS Swift Programming. 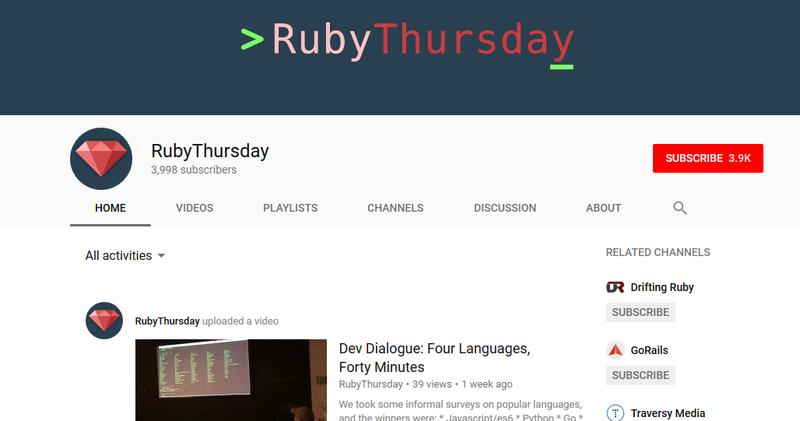 RubyThursday can be viewed as a library. It contains some amazing and widely accessed video tutorials especially designed for Ruby on Rails. It was introduced on April 9, 2015. Not only tutorials, but you can also find some interesting Ruby Roundtables discussing games, along with machine learning and software consulting. This is an ideal place to start your journey as a developer of Ruby on Rails. The host, Dain Miller, will help you to go through the tutorial videos. You can learn all the basic and advanced concepts of Ruby on Rails with the help of a step-by-step guide. It was first introduced in September 2014.